Susan is a very talented crafter and she also leaves wonderfully, support comments for so many on SCS. She is also a fellow Canadian ... and lives not too far from me. I'm hoping that some day we'll be able to meet up and make cards together. I chose this card of Susan's to CASE in her honor. 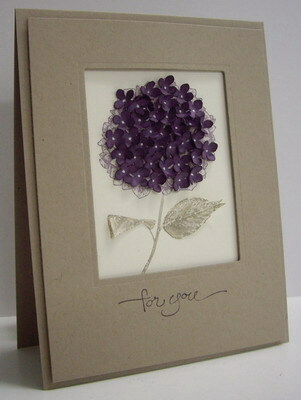 I have admired Susan's hydrangea card for a long time and today was the perfect opportunity to CASE it. I love the dimension Susan has on her card by adding punches on top of her stamped image ... so I did the same, just changing to the colours of the CAS - Colours & Sketches challenge blog for this week (Crumb Cake, Very Vanilla, Perfect Plum). I colored the stamp with my Stampin' Write markers and stamped onto the Very Vanilla cardstock. I used my blender pen to soften the ink colours a little. I then punched out several small hydrangea blooms, sponged around the edges, shaped them and then glued on top of the stamped image. I stamped a second set of leaves, cut them out and adhered them on top of my stamped image using rolled glue dots (paper tole technique) ... this gives them more dimension to balance out all the dimension from the blooms. Once everything was dry, I added white dots to the center of each bloom with my white gel pen. I couple of other things to share with you. First, thanks to Mynnette of Inkspirational for picking this card as the winner for Challenge #2 of her new challenge blog. I'm so honored!! And also I wanted to thank all of you for taking the time to look at my blog and a special thank you to everyone that takes the time to leave comments. I so love hearing from you! The past six months has been a very trying time for our family with many serious and devastating health issues. I have been absent for the past several weeks from my blog with the exception of my Design Team commitments. I have realized that I must make it a priority for me to have some "down" time from all the stresses, and for me that is creating and posting cards, and having time to look at other crafter's blogs (which I love to do!). So hopefully you'll see regular postings from me again soon. Thanks for all your support! Hi Lolly girl. I just love how you added the punched flowers for dimension. Wowee. Loll this is absolutely gorgeous. I really must give this a try (I have this stamp set). Love the dimension, and your colour choices make the flower very striking. Stunning is the only word that comes to mind Loll! This card is breath-taking. Almost ethereal, Lolly, like a thousand butterflies bursting into bloom! Me, in awe. I'm glad to hear that you are stepping back and allowing yourself to have some "me" time with DH and your card creations. It fuels you up again, actually, so you have even more energy to care for and lift up those who need you. Loll, thank you so much for honouring me as Queen for the Day with a CASE of one of my cards. And I have to say you picked one of my favourites of my own cards - one that I was especially proud of. So I'm even happier to see it CASEd! I'm glad to hear you are recognizing the need to have down-time to cope with all the stresses of the health issues in your family - I seem to remember you telling me to do the same last year when I debated cancelling a trip!! We really will have to meet up one day and make cards together! Wow - that was a lot of work! Such a beautiful result! Thanks for joining us at CAS Colours & Sketches! Oh, this is so pretty with all the dimension! Congratulations on your win at Inkspirational! That is a GORGEOUS card too! I hear the angels singing on this one, Loll! 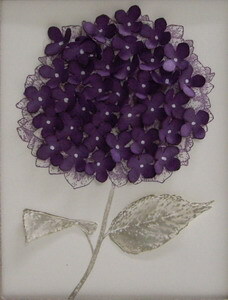 I adore hydrangeas (as evidenced by the photo at the top of my blog) and neutrals and purple...so this really struck me. Love it! Thank you so much for the nice comments you have left for me lately, and being a follower of mine. I truly appreciate your visits! Loll, I just wanted to say that I am so pleased you got the top 3 with this card as I so loved it! I don't mean to copy everyone else who has commented, but I just have to tell you how much I like your card!